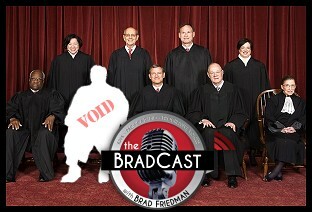 " Scalia's Voided Votes, GOP Obstructionism, and 'Potential for Chaos' Ahead: 'BradCast' 2/16/2016	"
The fallout from the sudden death of U.S. Supreme Court Justice Antonin Scalia continues on today's BradCast. First, the GOP continues to coalesce around the unprecedented idea that President Obama should not be allowed to appoint Scalia's successor, though some key cracks in that radical position may be emerging in the U.S. Senate. Constitutional law expert and Supreme Court historian and author Ian Millhiser joins us to discuss the extraordinary stance by Senate Republicans, how it could result in a Constitutional crisis on a number of levels, and how Scalia's death means that much of what we thought we knew about cases already heard, but where the Court's opinions have not yet been handed down, is all now upside down. "What Scalia's death means, in a lot of these cases, is where it looked like there was a possibility of a sweeping conservative change to law, that just doesn't look like it's on the table anymore," Millhiser says, as we examine how Scalia's death has changed everything we thought we knew about a number of very big cases now before the court --- on everything from immigration to women's rights to union rights to Congressional redistricting, affirmative action, the environment and more. Scalia's votes, Millhiser explains, on opinions that have yet to be handed down by the Court are now null and void. The result could be that several cases that looked very bad for Progressives may now have a much more favorable outcome. In others, however, if Republicans refuse to allow a Presidential nominee to move forward, splits in Circuit Court decisions across the country could occur, with the result of different applications of Constitutional rights depending on which jurisdiction you happen to live in and the "potential for considerable chaos" along with it. As to the GOP deciding to act responsibly to help avert a number of these potential nightmares for the nation, Millhiser is not optimistic. "What the Republican caucus is doing right now is unprecedented. It's unprofessional," he tells me. "I could come up with a lot of other words for it that I'm not allowed to say on the radio." "We find ourselves potentially at the beginning of a Constitutional crisis right now, because it's not like Republican Senators are likely to be any keener to approve someone to the Supreme Court if its Hillary Clinton's nominee or a Bernie Sanders' nominee. So we could be waiting a really long time." "Chances are the country is going to be in the exact same position if Mitch McConnell is still the Majority Leader [next year]," he notes ominously, adding that as many as three other vacancies on the Court could occur during the next Presidency. "It's possible these seats could remain vacant for years." « PREVIOUS STORY "'Green News Report' - February 16, 2016"
"Scalia's Voided Votes, GOP Obstructionism, and 'Potential for Chaos' Ahead: 'BradCast' 2/16/2016"
we have a recent precedent for making decisions from the Iowa caucus: just flip a coin. Makes as much sense as anything else going on in the US these days, and adheres the new principle of governance by chaos.